The upper as it is refered to, is or favorite water to fly fish for trout. The Big Manistee’s headwaters start in Antrim County near Alba. This diverse river winds almost 78 miles before flowing into lake Michigan. As fly fisherman we refer to this river as the upper Big Manistee and the lower Big Manistee. The lower being the great tail water fishery for Salmon / Steelhead below Tippy dam and the upper being the area in and around the "flies only" section located from M72 down stream to CCC bride. The upper Manistee is our favorite trout water. Great hatches, good accessibility and trophy trout fishing is what this section is known for. The upper section produces some of the largest trout in the Midwest on a fly. It is easy to see why the upper Manistee is our favorite river to fly fish for Trout. 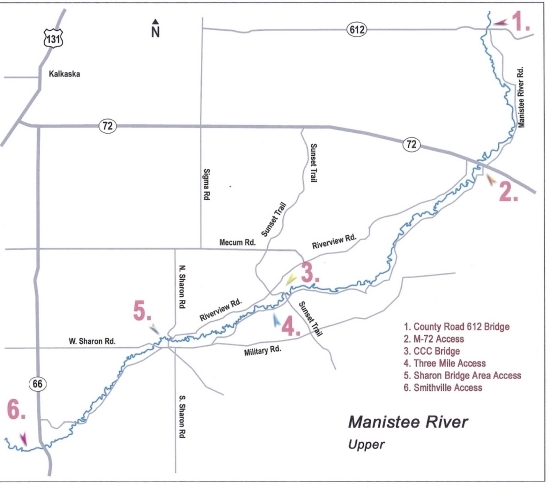 The upper sections of the Big Manistee River is open in the flies only year round, and the rest of the trout water is open from the last saturday in April (trout opener) untill the last day of September. The trout season on the upper Manistee River starts with great streamer fishing in early May. Trophy trout have been sitting in winter pools and have moved into the log jams that they will call home for the summer months, and are looking to ambush any good sized meal if opportunity presents itself. May also produces the first good hatches of the season: Hendrickson's, Bwo's, Early black stoneflies, Caddis, and Sulphurs all bring fish to the surface. June leads the fly fisherman into one of the best months to fish the upper Manistee River. Hatches of Iso's, Drakes, and Hex's make this river come alive with great fish opportunities on the surface. Night fishing turns on as the Hex hatch gets rolling in mid June and remain strong into late summer. 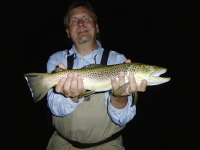 Big brown trout love to chase waking patterns in the shallows after dark. Fishing a mouse or frog pattern in areas that trophy trout live can only lead to fishing tales to tell others. July & August can be a productive time to fish, and can also challenge most fisherman. Hoppers, ants, and small mayflies is the name of the game. Fishing in the am hrs is a good start. Look for big trout to look to feed on the surface near structure. Nothing is more rewarding then having your hopper pattern smashed by a 20" trout! Fall on the upper Manistee can not be captured on a camera, fall colors cover the gin clear spring feed waters of the upper Manistee River. Fish are looking to bulk up before the spawn and are looking for good sized food sources. Fishing a crayfish pattern or large leech or sculpin pattern can move trout into a feeding mode and test an anglers skills in just seconds! The heart of the upper Manistee River is located between Grayling and Kalkaska Michigan. Access to the Manistee is good and so is the wading opportunities. A good guide can float a fisherman for miles, offering many opportunites to throw a fly at great trout cover. Although the fishing is great on the Manistee River, a good guide can help to put an angler onto good places to fish, as well as help with presentation and fly selection. Jon's Guide Service has been guiding anglers on Michigan rivers for 25 years. Certified FFF casting instructors the best gear in the business, and a passion for great trout fishing is what we have!